• Why does Chiropractic work? Chiropractic is the largest natural primary health care profession in the world. It is the art, science and philosophy of realigning vertebrae (bones) that are out of alignment in the spine to restore function in the nervous system (nerves). The human body is controlled by nerves. Everything (circulation, breathing, etc.) is under the direction of this unbelievably complicated system. If the impulses of this network are transmitted normally to and from the brain without interference, the body will be at its optimum and able to ward off disease to the best of its ability. If these impulses are stopped or interfered with, the area dependent upon them will malfunction and/or become diseased. When a vertebra in your spine becomes misaligned (subluxated), it can cause nerve interference. Chiropractic is the only profession that utilizes gentle spinal alignments to remove nerve interference so that the body can heal itself. Chiropractors focus on the spine and the nervous system to correct problems throughout the body. Although my practice is principally focused on muscle, bone (spine, neck, lower back) and nerve pain, many patients relate other problems and are relieved due to chiropractic treatment. This may be due to pressure removed from the nerve by movement of the bone off of the nerve. Most chiropractors believe this to be so. The nervous system is the area of the body that controls and coordinates all the functions of your organs. It is connected to every organ, tissue and cell in your entire body. When you feel hot or cold, feel a feather running across your arm, feel someone pinching your cheek, it is the nervous system working. When you take a drink, it is the nervous system that allows you to move your arm up and down and gives you the ability to taste what you are drinking. The organs could not function without the nervous system. The nervous system is controlled by the brain. The brain tells your nerves how to function. The brain communicates with the spinal nerves through the spinal cord. 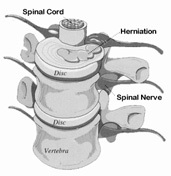 The nerves pass through the vertebra, or spinal bones through a little hole. The autonomic nervous system is responsible for the functioning of the organs. This system communicates by nerves that run on top of the spinal column and join with nerves that go to the various organs (and glands). If the nerve gets interfered with in any way, (i.e. subluxation, muscle spasm on nerve, severing nerve), the organ, tissue or cell most likely will have a decreased function. The lack of function may be imperceptible to the conscious mind. Or you may experience a symptom such as numbing, tingling, or pain. When the nervous system is interfered with, it reduces the bodies natural healing process. Removing the interference to the nervous system is the job of the Chiropractor. By removing this blockage, not only does the pain usually subside, but function such as range of motion of your neck, lower back and pelvis improve. Decreased headaches, migraines, cervical tension headache, numbness and tingling in the arms and legs and muscle cramping are relieved. This process is called an adjustment. Although this office does not treat associated problems such as asthma, menstrual cramps or irritable bowel disorders, as a consequence of treatment to the spine, patients commonly observe that these symptoms may improve. This is the heart of chiropractic, the art of Adjustment. The doctor applies a gentle force to the spine that unlocks the vertebrae (bone) that is out of alignment. Once the vertebrae are in alignment, the body can restore its normal nerve function. Your doctor of chiropractic has gone through four academic years of chiropractic training, after undergraduate college, to learn human anatomy, physiology, and radiology in depth. All for the sole purpose of learning how, when ,why ,and where to apply that gentle force called Chiropractic Adjustment, and to help you, the patient, prevent your subluxation from recurring. Welcome to our office and your initial evaluation. On your initial examination you will consulted by Dr. Semente. He will speak to you at length regarding your past injuries, when your condition first began and whether it has gotten worse over time. He will ask you what medical doctors or physicians you have seen with respect to past treatment. Your past treatment may include other chiropractors who you have seen as well. Questions regarding diagnostic testing in the past will also be of interest. If you have you had an MRI, or blood work that demonstrates certain problems we should be aware of. Do you have a history of motor vehicle accidents or work related injuries that have created problems for you. Do you have any genetic or other family related problems to the back and spine which may predispose you to the problem that you bring to the office. Questions like this are routine during physical examination and are guided by what you say to me. The physical examination is a standard orthopedic and chiropractic evaluation. It employs routine range of motion evaluation of the neck and low back. Your reflexes will be checked and your blood pressure. Sensory testing of the upper and lower arms, legs and back are performed to find out which nerves might be effected. We will measure muscle strength to see what muscles might be weak and if they are weak they might be related to a pinched nerve in your neck or back. We will check your vascular flow in the neck, low back and arms to see if there might be a reason for your problems due to abnormal blood flow. After physical examination we may, or may not x-ray you depending on what the examination and consultation demonstrates. However, if you need an x-ray we can do it in the office and we will proceed to tell you what the x-ray might show for the condition you present. Your next visit will be a report of your physical findings and we will sit down and show you your x-rays. We will show you the area and/or areas of the spine that are producing your pain. We will tell you whether these are referring pain down your arms or legs. The cause of your condition should start to become clear. At that time we may discuss additional diagnostic testing such as MRIs, CT Scans or Computerized Range of Motion (DMG-muscle testing by computer) or Electrodiagnostic testing. Many of these services can be performed in the office and some, such as MRI and CT Scan must be referred. Not all patients need this testing, but when they do, it is a full service office that gives you the opportunity to have these evaluations, when appropriate and necessary. Lastly, patients sometimes require full management. Your condition maybe so severe they require not only medication but also conservative chiropractic treatment to decompress nerves and painful joints. In this case, the office refers to orthopedist, neurologist and any other medical specialty that will help you get well, along with our care. It is our experience however, that many patients have already had medical referrals before they come in and are ready to begin chiropractic care to become well. I do hereby affirm before God and these assembled witnesses that I will keep this oath and stipulation. To hold in esteem and respect those who taught me this chiropractic healing art; to follow the methods of treatment which according to my ability and judgment I consider for the benefit of my patients; to abstain from whatever is deleterious and mischievous; to stand ready at all times to serve humanity without distinction of race, color or creed. With purity I will pass my life and practice my art; I will at times consider the patients under my care as of supreme importance; I will not spare myself in rendering them the help which I have been taught to give by my alma mater; I will keep inviolate all things revealed to me as a physician. While I continue to keep this oath inviolate, may it be granted to me to enjoy life and the practice of the chiropractic healing art; respected by all people at all times.